Growing up, Martin always ordered strawberry cheesecake when eating in a restaurant. “The Keg was a family favorite,” said Martin, who grew up in Briar, not far from Lake Forest Park. And, of course, there’s a recipe for a Strawberry Cheesecake Shake (p. 81). Her dad used to put bacon in waffles, which inspired her savory-sweet homage to her childhood, Bacon-Oatmeal Raisin Cookies, which Martin then uses as the key ingredient in a shake. Martin was a Girl Scout for many years and those campfire memories live on in the S’mores Shake (p. 71). Of course, it’s not all childhood nostalgia. 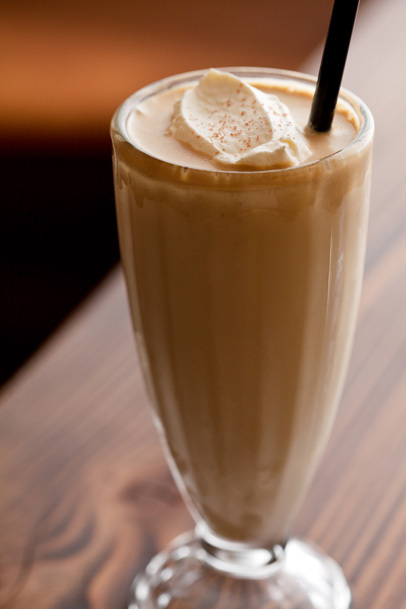 There are some very adult beverages on these pretty pages, including the Not Your Grandma’s Apple Pie Shake, the Salt and Pepper Malt, and the Chocolate Espresso Whiskey Malt (make that one mine, please). Since the booked launched, Martin has been touring up and down the West Coast and demonstrating the recipes at her shop and around Seattle. Coming up, Martin will have a special class for Mother’s Day, where she’ll show how to make two sauces: her rightly famous organic sea salt and caramel sauce and a new Meyer Lemon sauce. Then, she’ll explain how to use them in creating those heavenly shakes. The class is May 11 at 2 p.m. The $50 fee includes a signed copy of the book and a jar of caramel sauce to take home.